Thanks Siguie... I like the way you dig a little deeper for an explanation. It looks weird, and not at all like any woman I've ever seen. It's built like a man for sure (not saying women don't/can't work out) and it has a manly figure and muscles too. Why would it be in the wall though? That's just weird if it is a spirit, but anything is possible. I have seen them go through solid objects before right in front of me. I don't know about this one, it's creepy to me. The color is strange and it just doesn't look right to me. I know what Tantric said but I kinda feel like something's just not quite right with this one. It makes me feel nervous looking at it.. if that makes sense? I'm not sure I understand why you feel nervous looking at it.... could you elaborate a bit? The impression does seem to be male and not female. We all study ghosts and the paranormal but do we always consider a ghosts ability? I mean, a ghost/spirit can materialize or even come/go through a wall. And in this case, if it were a ghost, maybe it became part of the wall. Like when you see them in a window or a turned off TV. Just a thought. It's not something I would ever expect to see, it looks like it could physically do something to someone. I just get the vibe from it that it might be menacing. I could be wrong of course, and I really hope that I am. We're not sure what this is yet, but it sure is intriguing. To touch on your statement about thinking of a ghosts ability, Just yesterday I was moving things around in my garage, and put a new card table with chairs in there too. My mom was here and my new girlfriend was as well, they were helping sweep and stuff like that, just hanging out and talking too. It got so active out there that it actually was a bit scary to them. In the middle of the floor (concrete) it sounded like somebody dropped a brick or more so a huge weight in the middle of the floor, it happened TWICE. Then, a lighter flew across the room and we all saw that as well. Nothing could have caused that but energy. No wind, it didn't fall, it sailed across the room and landed on a futon. I politely asked them to stop for the moment and that we weren't moving away or anything. It stopped after that. So yes, in my opinion, spirits can do just about anything within the means of what we allow them to. I think that in this case, if that's what is displayed in the pic, a spirit, then it is wanting people to know it's there. I think somebody's playing a prank via Photoshop. Edited by SarahB1863, 11 November 2016 - 04:18 PM. Edited by Roxstar, 11 November 2016 - 05:13 PM. I THINK WE'VE SOLVED THE MYSTERY, FOLKS! The funny thing is is that. When going about my business during the day, I was actually thinking about this photo and Michelangelo's famous masterpiece of GORGEOUS young male anatomy did cross my mind. When you read the OP's story....I can kinda see the usual markers....like the Native American reference....it's right up there with chestnuts like "Indian Burial Mound" and "I found this in my Grandma's attic". I mean; Why else would one bring up the fact that the person who designed the house was Native American? Are Indigenous American people "magic" or something? "Hi! I'm Joe Q. Roadworker and I'm a Seminole. That means that roadwork I did on the Tammiami Trail has infused it with magic powers or something. I dunno." Oh; Concerning David....BEAUTY NEED NOT BE CENSORED. Edited by SpukiKitty, 11 November 2016 - 08:38 PM. I think if that was the case, it would have taken a lot of Photoshoping to redesign it into the shape we're seeing. But anything is possible, I guess. I would LOVE to say you might be right. However; once you see the youthful future King of Israel, au-naturel in marble, you can't un-see it! ....Now; The OP may have used a photo of the statue that was taken at a VERY slightly different angle (the photographer standing slightly more to the Right of the statue....or 'David's' Left) but it's unmistakable. The arms, the muscles, the abs, that pelvic crease, the belly button....C'MON! THIS IS A BIG FAT FAKE-O-RAMO! Nice try; O.P.! It was a good try, though. You almost had me! Kudos for that. Edited by SpukiKitty, 12 November 2016 - 08:14 AM. I don't see it being so obvious like some of you.... and I can list reasons way. And I will if need be at some point. But you're right, there is a big resemblance, in my opinion. Anyway, I'm still not completely convinced about it being fraudulent, so I will still be publishing the photo and story. But you guys are really making me think a little differently about things. Keep it up.... you may win me over yet! Well; I don't want you to look like a fool. That said; You can still post it with the mention of our discussion and theories and possibility that it might be a fake. 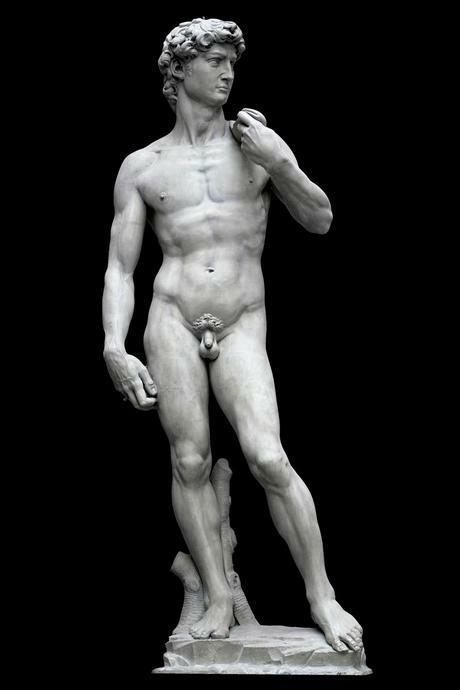 It seems no one has thought of, the possibility, that the owner/architect has a replica statue of David in his bathroom. Now THAT'S a good theory. That said; If it was the case then the photo sent would be reversed since the "ghost" is shaped like the statue of David rather than a reversed mirror-image. Finally something I can comment on with a bit of knowledge. I'm actually a tile and stone contractor, have been for the last 21 years and I know that I have never seen tile reflect like that. 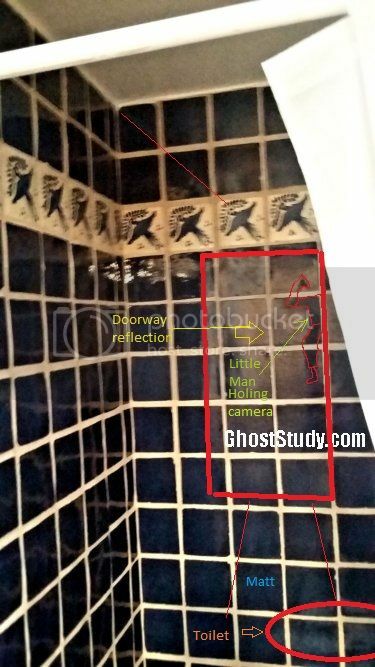 The tile in the picture is a Spanish or morocan style and even when brand new it has very little or no reflective properties to it. I have stood in front of many showers that I have just grouted and polished and have never seen my reflection, not even on highly polished marble. Anyway I hope that helps.